Since we use essential oils on ourselves, it is only natural to want to extend the benefits and use them for animals we love. However, one quick search on google and suddenly panic sets in. One site says they are completely safe while another has horror stories on pets being mortally wounded by well-meaning owners using oils on their pets. So how do you know who to trust and what you can use safely? In this article, I am going to dispel some of the myths that are out there. 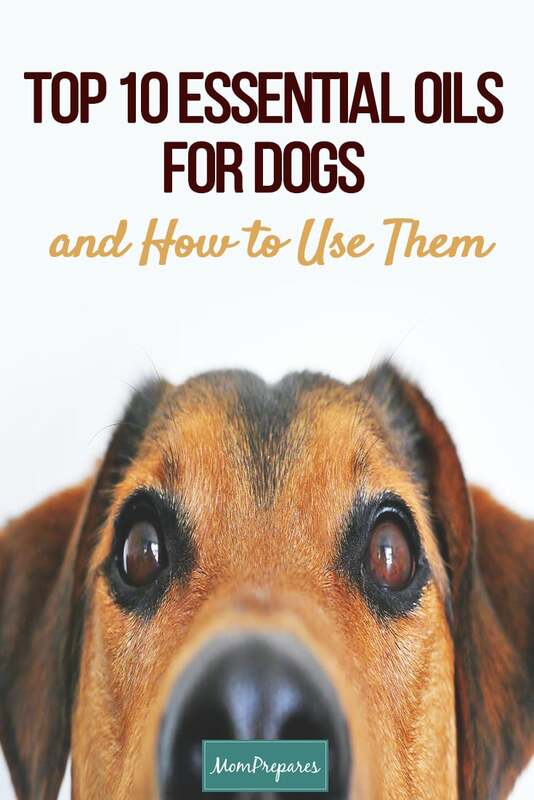 By the end of this article, you will know what the top 10 essential oils for dogs are, and more importantly, how to use them safely. You are also going to find out there are no all-encompassing pet safe essential oils, and why. There’s a whole lot to cover, so let’s dig in. There is a lot of misinformation surrounding pets and essential oils. As someone who has worked with and studied oils for a decade, I can attest to the fact that there is a ton of confusing information when it comes to essential oils and pets. Even within the sources I have come to know and trust, there are disagreements as to what is safe and what is not. There are extremes on both ends. For example, many flea preparations use Pennyroyal (Mentha pulegium). This is an oil that, while effective in deterring fleas, is also highly toxic and a known abortifacient. On the other end, there are people that say not even Lavender (Lavandula angustifolia), one of the safest oils, should be used on animals. Just as with humans, it is crucial to exercise some common sense when administering any treatment to animals. There is no reason to use a toxic oil when a gentler one can have the same effect. Animals should also be cared for with the same gentleness as with babies. You shouldn’t give a baby an adult dose of oils, and in most cases, the same can be said for animals. It is imperative to consider what type of animal you are treating as well as their size. A blend that one dog can tolerate could be toxic to a cat, bad for puppies, or harmful to pets or dogs of a different size. Animals are as unique as humans are. You may love Clary Sage (Salvia sclarea), while your best friend may hate it. Our furry friends have their preferences too, and these must be figured out and taken into account when using essential oils for pets. There are many dog-friendly essential oils, but even those that are considered safe can be toxic to dogs when used incorrectly. First, anytime you wish to use essential oils for animals of any kind, you must make sure that you are only using 100 percent pure, quality oils. You’ve probably heard terms like ‘therapeutic grade,’ ‘food-grade,’ or even ‘medical grade’. But these are just marketing terms with no governance. Seek out only unadulterated and organic oils that are from a reputable supplier. This list of dog safe essential oils is not exhaustive. You may also find there are animal-specific blends from certain companies, such as Infect Away essential oil or Animal Scents oils like Puriclean from Young Living. Other oils can be used to combat issues that come with having animals, like using a Purification oil for dog’s areas to reduce odors, but not necessarily to use on the animal itself. Some oils that can be safe, like lemon essential oil, can also be harmful to dogs when not used correctly. Just like citrus oils are photosensitizing to humans, using lemon oil for dogs can cause burns, redness, and other sensitization when exposed to the sun. You may also hear a lot of people using clove oil for dogs. In her book, Holistic Aromatherapy for Animals, Kristen Leigh Bell points out that the phenylpropane eugenol in clove (Syzygium aromaticum) can burn skin. So it would be wise for people to not use on their dog at home. What essential oils are toxic to dogs? These are toxic to cats and dogs alike. Again, this list is not exhaustive. It is important to remember that 100 percent natural does not equal 100 percent safe, whether talking about uses for humans or using essential oils for pets. What are some essential oil uses for dogs? Pain relief oils like Black Pepper (Piper nigrum) can be used at very low dilutions as long as homeopathic remedies are also not utilized. This should be used for dog’s joints, pain in dogs with arthritis, or sore muscles, and not pain from a wound. It is sometimes said that dogs with cancer can benefit from oils like Frankincense (Boswellia carterii), which is often recommended for tumors. However, this can have the opposite effect and may protect the cancer cells. Freshening blends can be made with four tablespoons of baking soda mixed with a teaspoon of Sweet Almond (Prunus amygdalus var. dulcis) carrier oil and a drop of oil like Spearmint (Mentha spicata) or Cardamom (Elettaria cardamomum). Oils like Myrrh (Commiphora myrrha) can be beneficial in blends for puppy teething pain. If your pooch’s paws become cracked and inflamed, a low dilution of soothing oils like Roman Chamomile (Anthemis nobilis) can be mixed into a carrier oil like coconut. Travel anxiety can be reduced when using lavender oil for dogs. There are many techniques for using oils on dogs and other animals. Balms can be made from blends of a couple drops of oil, carrier oils, and thicker additions such as cocoa or shea butter, and beeswax. These are good for spot treatments on the skin and paw or hoof issues. Gels are made from silica or aloe vera with a couple drops of oil added and are used for the skin. These are great for skin applications, bedding areas, as room sprays, or for calming the animal during travel. Carrier oils can have a couple essential oil drops added, tinctures, hydrosols, and more. These blends can further be added to gels, balms, ointments, or even just applied as is to problem areas. Whenever you are making a blend to use on a dog, please remember that less is more. A good general guideline is to keep the dilution around 0.5 – 1%. This would be about 2 – 4 drops total of essential oils to each tablespoon of a carrier oil. There is a lot of controversy concerning the use of oils on cats. While there are some veterinarians that have found success with this, like Melissa Shelton, DVM, there are also horror stories of cats becoming violently ill and even dying. Cats are much different than humans and even dogs. They process chemicals differently than other animals. Their livers lack certain enzymes, namely UDP-glucuronosyltransferase, that helps eliminate the buildup of toxins. There are a variety of companies that tout their oils are a therapeutic grade or some other marketing term, and therefore any of their oils can be used on animals without issue, including neat. This is completely erroneous. You cannot change a cat’s physiology based on a product, and dangerous metabolites can still build up and cause toxicity and seizures. Because of this, it is highly recommended that people do not use oils on cats at home without consulting someone clinically trained in such use, and through more than theory. It is much safer to stick with gentler solutions like hydrosols. Toxic buildup can occur in cats through inhalation as well. When using an aromatherapy diffuser, make sure it is in a well-ventilated room, and give all of your animals a way to get away from the scent. Most people say that other animals, especially birds, should not be exposed to essential oils. However, there are documented cases of even birds excelling with the use of them. Because of their varied and delicate nature, it is wise to steer clear of essential oils with other pets like birds, reptiles, and small rodents without the guidance of a trained professional. Although you shouldn’t apply oils or give them internally without consulting someone, there are other ways you can use oils for animals. For instance, a drop or two of Lavender can be added to two quarts of water and used to wipe down cages after cleaning. Make sure to let it dry before reintroducing the animal. What oils are good for dogs? – When trying to determine what essential oils are safe for dogs, be sure to only seek out 100 percent pure, unadulterated oils. The list above is a good starter list. Can I diffuse essential oils around my dog? Everything in moderation. Diffusing oils around your dog is fine in my experience. Is diffusing essential oils safe for pets? – Even for humans, diffusing too much can cause issues. Always make sure there is good ventilation, and make sure the animals can leave the room to get fresh air. What about cats and diffusing essential oils? – Diffusing oils around cats must be done carefully. Be sure your cat has access to fresh air at all times, and do not diffuse around the clock. If you want to err on the safe side, then don’t. Can I use essential oils on my dog? – Some oils can be used on a dog, but they should be properly diluted. There is rarely a reason to use an oil neat. Is clove oil safe for dogs? – According to Kristin Leigh Bell, neither Clove Bud or Clove Leaf oil should be used on a dog. Is lavender oil safe for dogs/ Can you use lavender oil on dogs? – Lavender (Lavandula angustifolia) is one of the best essential oils for dogs. It should not be confused with other types. Where can I buy lavender oil for dogs? – Lavender oil and dogs can be a great combination when it is a quality product. Always seek out reputable suppliers that sell pure, unadulterated oils. There is no such thing as “lavender for dogs.” The same oil you use for yourself is the same your pooch would get. How to use essential oils on dogs? There are many ways to use essential oils on dogs. They can be made into healing ointments, sprays, added to natural shampoos, and more. Can frankincense be used on dogs/ Is frankincense safe for dogs? – Yes, frankincense for dogs is safe when used in moderation. Is lemon essential oil safe for dogs? – Lemon (Citrus limon) can be safe at low dilutions. Only choose organic lemon oil due to pesticides often used on citrus, and keep in mind this is a phototoxic oil. Is orange oil safe for dogs? – Just like lemon, organic Sweet Orange (Citrus sinensis) oil can be useful in small diluted quantities. However, extreme care must be taken in even diffusing citrus oils around cats. Is thieves oil safe for dogs? – Thieves is a blend of multiple oils. It has Rosemary (Rosmarinus officinalis), Clove (Syzygium aromaticum), Cinnamon (Cinnamomum zeylanicum), Eucalyptus (E. radiata), and Lemon (Citrus limon). Some of these oils should not be used on animals. For instance, clove oil for dogs is not recommended, so no. Thieves oil is not safe for dogs. Can you use essential oils on cats? – It is better to err on the side of caution and not use essential oils on cats at home. Choose milder hydrosols instead. Can you diffuse eucalyptus oil around dogs? – Yes, however the best one to choose is the milder Eucalyptus radiata. Aromatherapy for pets is a highly controversial topic, even amongst experts in the field. Trying to decipher the information surrounding essential oils and animals can be a headache, to say the least. When using essential oils on pets, there are certain common sense approaches to take. First, use only 100 percent pure, unadulterated and organic oils. Second, remember that just because it is natural, does not automatically make it safe for dogs and cats, or humans for that matter. Extreme care should be used when using essential oils with cats. It is wise to seek the help of a professional with this as well as using them with smaller pets like reptiles, rodents, and birds. Even diffusing around them can be dangerous. Using essential oils on dogs can provide wonderful results, but some can be dangerous for dogs. Always research the oil, animal, and method of use prior to using any oil for dogs or any other pet. In any situation, always choose the gentlest method you can when caring for your fur babies! I read myrrh essential oil applied to dog’s paws can prevent the dog from licking (a problem my dog has). I need to know what carrier oil I should dilute it with, the ratio of carrier oil to myrrh essential oil, and what medium should I use. Or can I add myrrh oil to water and spray his paws? Thank you for pointing out that myrrh is safe for dogs. I’ve been wanting to try the myrrh oil and now that I know it is safe I want to find the best place to get it. I’ll have to do some research and find some great myrrh oil in my area.